During 2016 work progressed steadily on upgrading the former LMS line between Oxford and the newly opened station at Oxford Parkway. 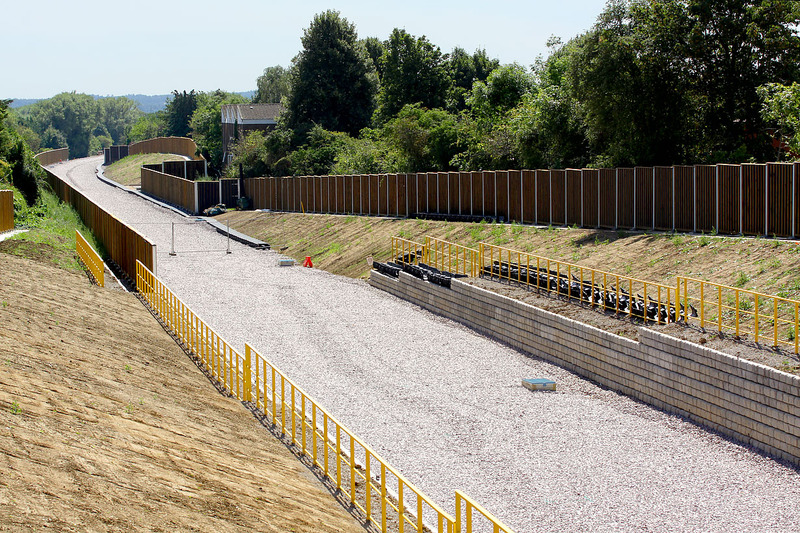 This is the view looking south from the recently rebuilt First Turn bridge, near Wolvercote Tunnel, taken on 24 August 2016. Network Rail had originally agreed to lay so called 'silent track' here, in order to cut down on the disturbance that residents either side of the line will experience when this former sleepy single track byway is transformed into a busy mainline. However, they have now reneged on this promise, and are relying instead on the tall fences seen here as noise barriers. In all fairness, there is no such thing as 'silent track', only possibly 'slightly less noisy track', so Network Rail are probably right not to use it.